The Bloom Collective has sent out the following image to several media outlets in Grand Rapids, and the poster has been appearing around the city itself. It is probably no coincidence that Kissinger will be speaking at the econ club in Grand Rapids the same day as the event listed on the flier above. 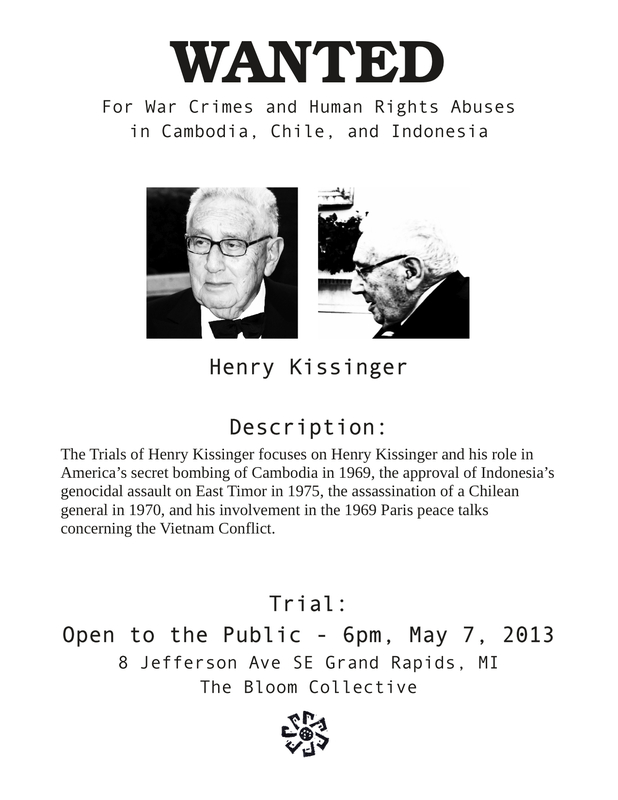 While the speech at the Devos owned JW Mariott downtown is strictly “members only”, those interested in learning more about Kissinger’s war crimes (and can’t afford $190 “Standard Membership” to the econ club, though they probably won’t be touching on Cambodia there anyhow) can attend the Bloom’s showing of The Trials of Henry Kissinger this upcoming Tuesday at 6pm. All Bloom events operate on a “suggested donation” model, so no one turned away for lack of US currency. Any and all questions should be forwarded to bloomcollective@gmail.com.